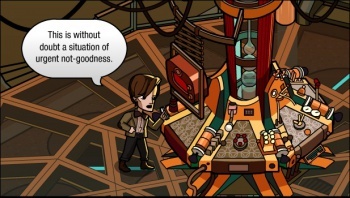 The Doctor needs your help in a new free-to-play MMO. If you've ever watched Doctor Who, you've probably imagined what it would like to be one of the good Doctor's famous companions. Wouldn't it be great to step into the TARDIS and join the Doctor on his innumerable adventures through time and space, trading witty banter as you save the universe? The upcoming MMO, Doctor Who: Worlds in Time will let you do just that. If you just can't wait to create your avatar, wield your very own sonic screwdriver, and piece the cosmos back together, though, you're in luck. As of today, the game is in previews, and open, free of charge, to Whovians everywhere. The setup for the game is fairly typical Doctor Who fare: The timestream has become fragmented, and isolated shards of time are tearing the cosmos apart. The Doctor, a time-traveling adventurer, has recruited you to track down these shards while resolving domestic disputes, tracking down hidden vaults, and defeating otherworldly villains by playing a number of minigames. Depending on the situation, players will need to play variations on classic puzzle games such as Pipe Dream, Bejeweled, and Tetris, which allow your character to unlock doors, outwit conversationalists, or beat up mechanical men. The game embraces the freemium model, but the in-game purchases seem pretty tame so far. While none of the content seems to be inaccessible to free players, those who feel overburdened by cash can spend it on Chronons. These Chronons can buy more actions per day (needed to go on new adventures) or purchase expensive items, from clothing to furniture (for your room in the TARDIS) to sonic screwdriver upgrades. As of right now, though, players can buy all of the in-game items with currency earned from quests, and actions replenish daily. While the game is still far from finished, it doesn't cost anything to play, so it's worth a look for Doctor Who fans. The minigames can be long-winded, but the dialogue is relentlessly clever, and the graphics are charming. Besides, unless you have a TARDIS handy, this preview is likely the only way you'll get to play the MMO before its official release. Come along, players.